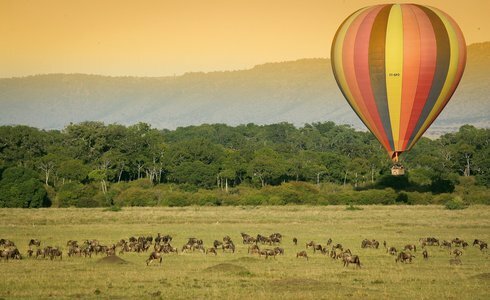 Experience the Masai Mara Landscape in a hot air balloon for unparalleled panoramic vistas and the abundant wildlife of the Masai Mara and if you visit the Mara between July and October, you will probably see the Great Migration. Kenya'as Masai Mara National Reserve is the ultimate ballooning destination. The landscape is stunning and free, and the abundant wildlife can make for spectacular viewings from above. As this is a wilderness area contiguous with the Serengeti National Park of Tanzania, with free-ranging wildlife that is not fenced in. If you visit the Mara between July and October, you will probably see the “Great Migration” of over a million wildebeest, along with large numbers of zebras and gazelles. An early start sees you on the magnificent Masai Mara, with a warm cup of coffee and a safety briefing from your balloon pilot before the inflation of your balloon. Take off is at dawn, rising as the sun rises and float in whichever direction the winds of the morning take the balloon. Your pilot will precisely control the altitude of your balloon so at times you will be flying at treetop height, sometimes even lower, offering a unique perspective and great photographic opportunities of the wildlife below. At other times he will ascend to 1000' or more to see the enormity and wonderful panorama of the Masai Mara. The flight is for about one hour depending on conditions. You celebrate in the traditional manner with champagne before sitting down to a full English breakfast This adventure will fit in with all safari itineraries that include a night in or around the Masai Mara region. *Pricing includes conservation fees and landing fees.